Laugh at ME, will they! The FOOLS! That’s basically how it starts. They scoff at me; they dare to think me mad! Because I have vision, a will of my own, because I do not swear allegiance to their committees and their trifling sentimental concerns! Well, they can say what they like now — but I will SHOW them! And from there, it’s pretty much just like regular apartment-hunting. You want high ceilings, and room to spread out, and you’re definitely going to need a lot of electrical outlets. In-unit laundry is probably a nice-to-have. So, here’s where we are: Dr. Lang has come up with a way to treat Barnabas’ vampirism, using blood transfusions, scotch tape and hope. 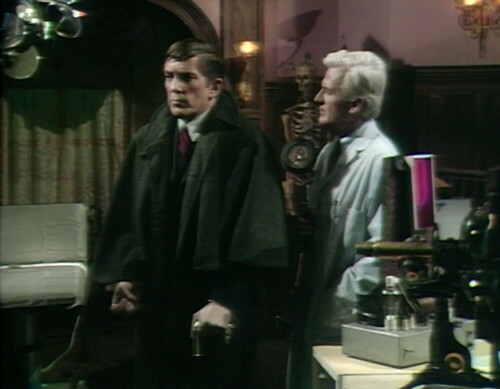 But Barnabas keeps getting cravings, and he needs to understand what Dr. Lang means when he talks about a permanent cure. 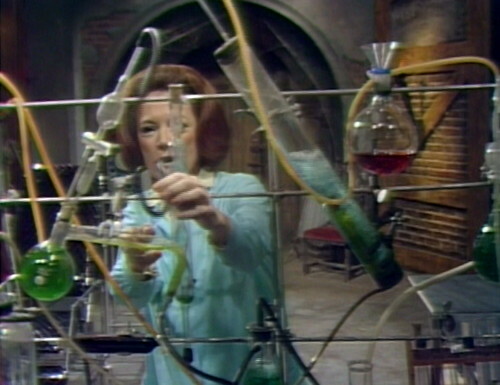 Lang brings Barnabas to his private laboratory, and it’s a honey — a huge, two-bed open-plan space with machines and beakers and mirrors and all the trimmings. There’s a skeleton hanging in the corner, in case you need that, and probably a cyclotron, and a mini-fridge, and obviously there’s some high-voltage spark gaps zapping away, even when nobody’s in the room. The lights are always on, over at Lang’s place. So it’s a fantastic set, which is a good thing, because I have a feeling we’re going to be spending a lot of time here over the next few weeks. This might be a redressed set from somewhere else, although I don’t know what else it could have been. There’s a little half-staircase leading to the door for some reason, and a huge arched window at the back of the set that’s covered with a curtain. And then there’s another door on the other side, which is completely blocked by knobs and switches and levers and what all. But it works really well, because it looks like exactly what it should be — the upstairs parlor of a weird old house, which Lang has filled with all of the crazy junk that he’s assembled over the years. This is exactly how you’d build your mad science lab — you just keep throwing stuff in it until it blows up, or the villagers come by with torches and pitchforks, and then you find another abandoned mill and you start all over again. Now, if you compare this lab to the apparatus that Julia set up in the Old House basement six months ago, there’s just no contest. Yes, Julia had beakers and dry ice and spark gaps and a bubbling cauldron of blood, but it just didn’t feel like home, you know? I mean, the placement of the main workstation pretty much says it all. Julia’s apparatus was set up right in our view, like she’s using it as a shield between her work and the audience. Lang’s setup is much more open and welcoming; it invites us in. Julia’s apparatus is just a machine; Lang’s laboratory is a place. So it’s no surprise that Barnabas is kind of overwhelmed by the whole experience. Barnabas: Incredible. Show me, what is to happen? Lang: You will lie here. And the life force will be drained from you, into my still unfinished work. Barnabas has his cape on, by the way. He hasn’t worn it for a couple weeks; he’s been going business casual since he was cured. It feels like now he’s dressed up for the occasion, which is adorable; you wouldn’t want to talk about your life force being drained into things if you’re in your gym clothes. And, oh! Right. Lang has one of these. It’s a monster! His very own stitched-together dead guy, made by hand from people that he and Jeff have dug up in the cemetery. Barnabas: What is it, doctor? Lang: “It”? Yes, I suppose that must be the proper designation, for now at least. Until it lives, and has a name. Barnabas: What about the head? Lang: That will come last. Barnabas: Last! Where did this body come from? Lang: I created it — and your life force will make it live! Yup, we’ve got another incoming narrative collision, and it couldn’t have come at a better time. We’ve been doing this mash-up of Jane Eyre and Dracula for a year now, with a slice of The Crucible and a dash of The Cask of Amontillado, but it’s time to take this to the next level. We need another monster, somebody for Barnabas to hang out with. And if you’ve already got a Dracula, then the obvious next step is the other classic 1931 Universal Studios film, Frankenstein. Putting Dracula and Frankenstein together is a really interesting idea, because — apart from Abbott and Costello Meet Frankenstein, of course, and Monster Mash, and The Munsters, and Mad Monster Party, and the General Mills Count Chocula and Franken-berry cereals, and Groovie Goolies and Monster Squad and Drak Pack and pretty much every Halloween decoration — it’s never been done before. Well, okay, maybe we’ve seen it once or twice, but have they ever done it as a soap opera, where they’re trying to put the vampire’s life force inside the patchwork monster in an insane alchemical stunt to reach spiritual enlightenment and redemption through changing the very nature of the material self? And then they talk about their feelings? I bet they haven’t. It sounds like when Lang was in mad science school, he also took a couple electives in mad lawyer, because he’s got a whole argument prepared. Barnabas: What about my present body and mind, what will happen to them? Lang: They would be dead, forever dead. Barnabas: And I would be free of Angelique’s curse forever. Barnabas: How can you be sure of that? Lang: Because you’d no longer be Barnabas! And Angelique’s curse was on Barnabas! He says this as if he’s been going over the contract on Angelique’s curse, and he’s found a loophole. But this is the key to the strange alchemy at work here, the twist that actually makes this weird summer-stock Frankenstein absolutely unique. The original title for Mary Shelley’s novel was Frankenstein; or, the Modern Prometheus, a reference to the legendary Titan who stole the secret of fire from the gods, and gave it to humanity. The mad scientist has “tampered in God’s domain”, asserting his personal dominion over the fundamental mysteries of creation. But in the Dark Shadows version, they’re not rebuking God — they’re tricking Angelique, a representative of the Devil. Barnabas is seeking refuge from her evil curse, renewing his spirit by giving up his old body, and leaving behind the weight of his guilt and his sin. Of course, you could also look at it as a mass murderer escaping punishment by hiding inside the stolen skin of a whole new set of victims, which probably makes it more of a draw, ethically. It’s really just darkness piled on top of more darkness. But this is Dark Shadows, so the mind-boggling insanity is delivered with such passion and enthusiasm that you can’t help but get caught up in it. Lang: Barnabas — I know this secret I possess. I know how to use it! I am almost certain of success! Barnabas: Well, all right, then — assuming that you would succeed, what would happen to my present memory, my recognition and feelings? Lang: I’m afraid I can’t answer that. Lang: I can’t answer that, or know what will happen, until your life force is infused into that body. Okay, you’re right. What the hell, let’s fire this up and see what happens. From the audience’s point of view, there’s no question about what we want in this situation. It doesn’t matter if this is ethical, or even comprehensible. It doesn’t matter that “life force” is essentially a meaningless term that they made up to explain acupuncture. It doesn’t even matter that Lang is leaving this rotting-flesh arts and crafts project lying on a table at room temperature for days on end, with no refrigeration. The only thing that matters is that going through with this experiment sounds like fun. 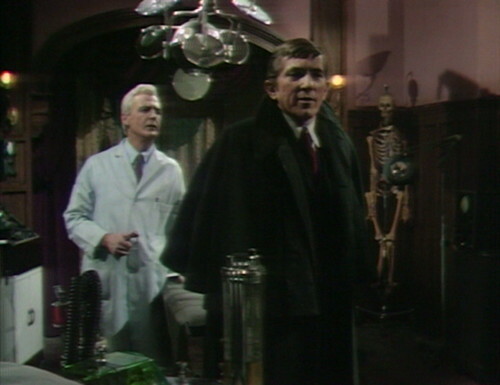 The whole point of Dark Shadows is to surprise the audience, and show you something that you never thought you’d see on television. This qualifies. And then, just when you think it can’t get any crazier, they start talking about the face. Lang: I still have some minor things to do before he’ll be ready. Barnabas: I think you also have a major thing to do, Doctor — the face. Lang: Ah, yes. Well, I thought it would be your decision about the face. At the beginning of the scene, Barnabas mentioned “the head”, but now they’ve started saying “the face”, and they’re going to keep on saying it all week long. Lang: Well, if the answer is yes, I think you should decide what the face looks like. After all… it will be your face. 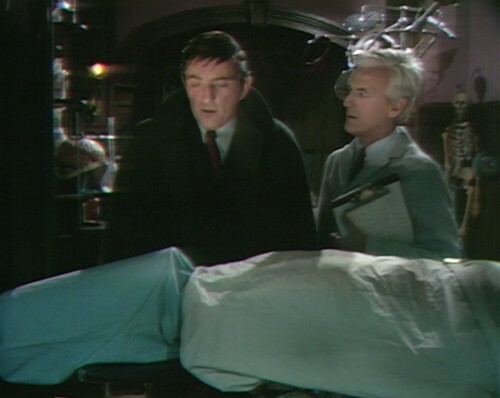 By the end of the episode, Barnabas asks if the face can look like Jeff Clark’s face, and Dr. Lang says that he can do better than that — it can actually be Jeff Clark’s face. And now we live in a world where two grown-ups are standing over a pile of discarded man-flesh and all they can do is talk about the face, the face, the face. 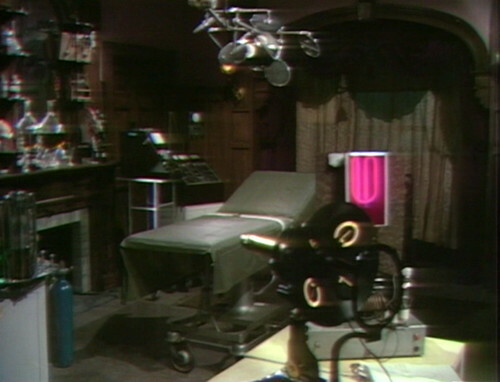 In the teaser, as Barnabas and Dr. Lang approach the empty bed in the lab, the boom mic swings into the frame. Amusingly, it appears just at the moment that Lang assures Barnabas that only one other person is aware that this room exists. When Dr. Lang tells Barnabas, “Well, that’s a chance that exists in any scientific endeavor,” someone in the studio coughs. Whenever you put Barnabas and Lang in the same scene, you’re going to see them trip over their lines pretty often. Lang: You will be reborn! Lang: By infusing my live creature with your life force, I will make you alive again! At one point, Barnabas just completely forgets what he’s supposed to do. Lang: You will be reborn as a fully intelligent, mature man! Lang: Barnabas… what are you doing? Barnabas: … I don’t know, Doctor. (He finally finds the teleprompter, and he moves to where he was supposed to be standing two lines ago.) I don’t know what to tell you. Also, Barnabas tells Julia, “That might not be as preferable… as leading the life I am now,” which I don’t think means anything. But everybody has a hard time figuring out what they’re supposed to say today. Vicki: You’re not making very much sense. Julia: Most of what I have to say isn’t. The scene with grave-robbers Dr. Lang and Jeff watching a gravedigger finish his work is a direct lift from the first scene of the 1931 Frankenstein. The Gravedigger is played by our old friend Peter Murphy, who’s made occasional minor character and stand-in appearances for the last six months. 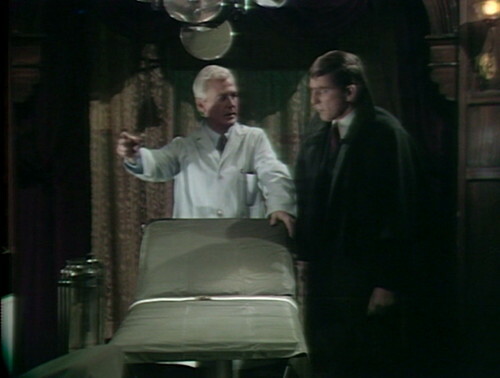 His first role was the recast Caretaker in October 1967, and he also played Barnabas’ aged hands a couple weeks later. He played Dr. Thornton in November, and the Gaoler in February ’68. This is his last appearance on the show. So Barnabas doesn’t care where the body parts come from – these could have been people who were killed and cut up for this project and what does he say – he basically wants Vicki’s boyfriend to be decapitated so that he can horn in again and destroy another chance for her happiness. The implication is that the body parts come from cadavers, so while on one hand grave robbing is a horrible violation of the deceased, on the other, it’s arguably recycling. Anyway, the plan is insane because Vicki, while holding many advanced degrees in cluelessness, might wonder why her boyfriend is now four or five inches taller. On a positive note, I really like the color scheme that Lang selected for his laboratory decor. That flashing pink strobe light is a great accent piece!! Anyway, this is my first post here though i’ve been lurking for a while. Currently doing my first complete DS watch from the Coffin box set of DVDs. And i was one of the kids “running home everday after school to watch”. The shape of that blue head dressing for the thingy in progress on the table of Lang’s lab always amuses me–could this be where Dan Aykroyd and the rest of the folks at Saturday Night Live got the inspiration for the Coneheads? 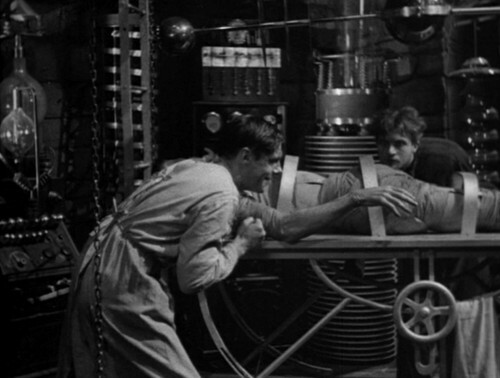 In terms of life force being transferred from a living being to reanimated flesh, this idea does have its precedent in one of the Frankenstein sequels, The Ghost Of Frankenstein (1942), in which Bela Lugosi plays Ygor and having reanimated the Monster has his brain placed in the head of the Monster, a sort of life force exchange but done through brain transplant. As for life force transfer via electronic means, there was a Gilligan’s Island episode from exactly two years before where the mad scientist Dr. Boris Balinkoff (Vito Scotti) takes the castaways to his island and with the help of his assistant Igor (Mike Mazurki) performs electronic personality swaps by locking them in glass booths whose electrical currents are signaled by a ship’s telegraph and characters become each other in terms of personality and voice. 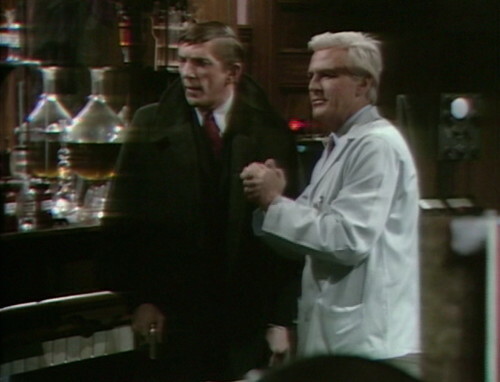 Perhaps the Dark Shadows writers combined these two sources for the lab scenario of Lang’s setup–but no matter, as whatever is done on the show is being done for the first time in the soap opera format. Which is why Dark Shadows was really a nighttime show, and this is what Dan Curtis was originally aiming for when pitching his idea to executives for a television schedule. It seems as if Dan Curtis has decided the show is now about monsters. But this is just a phase. Dark Shadows hits its stride when it eventually gets around to telling stories of romantic love overshadowed by evil forces. The bit about Lang finding a loophole in Angelique’s curse is witty, but only if you want to make sport of the mad doctor’s awkward turn of phrase. I prefer to think Lang is better with a scalpel than expressing complex ideas in short sentences. But you’re absolutely right, this is a clever twist on usurping God’s Power of Creation. Danny, ordinarily I wince when you mercilessly deconstruct the show that filled me with awe and wonder and suspense, but I give you free rein when it comes to Dr. Lang and Adam (and especially Eve). Indeed, have it! There are some marvelous things coming up in the next few months, but this Frankenstein business is my least favorite. You win back all my admiration when you write: “But this is Dark Shadows, so the mind-boggling insanity is delivered with such passion and enthusiasm that you can’t help but get caught up in it.” When you say something like that, then I am convinced we are watching the same show after all. Yeah, it’s the same show. It’s filled with romance and danger and smoke and sound effects and disaster and marionette bats and, every once in a while, perfect moments of truth. I’m happy to give them credit for the beautiful stuff, but they have to earn it. 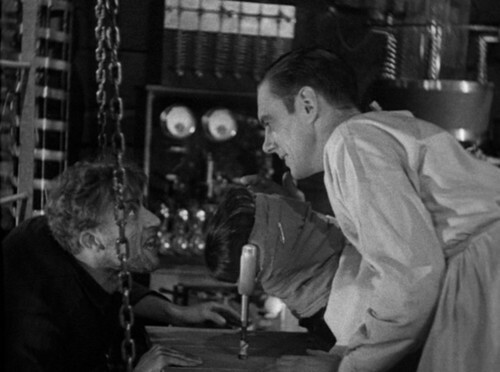 I’ve watched a lot of B movies involving mad scientists over the past few years, and when I saw Lang’s laboratory I couldn’t help grinning in delight–it’s a perfect mashup of the best of them! I also grinned in delight when I saw Barnabas sneaking into the garden to get Julia’s advice. In any other soap opera this scene would indicate the start of an adulterous affair! One more blooper: when Barnabas comes back to Lang’s lab, you can see a stage hand tapping on the Jacob’s ladder thingy with a wrench to try to get the electric spark moving. 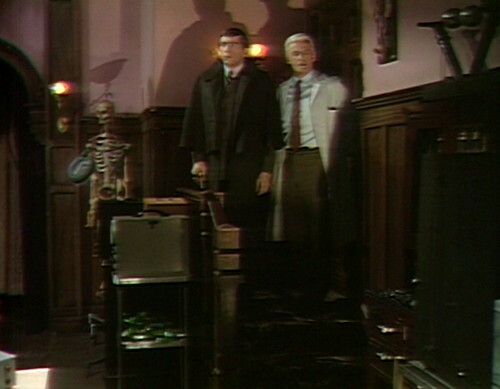 Kind of a blooper–When Barnabas returns to Lang’s lab at the end of the episode, he knocks on the laboratory door–but the lab is obviously inside Lang’s house, so somehow Barnabas must have entered Lang’s house uninvited. Continuity error–It seems in this episode that Barnabas comes up with the idea of using Jeff Clark’s “face,” but an episode or two ago, Dr. Lang already suggested to Barnabas that he could look like Jeff Clark if he went through with his proposal. Why are we considering transforming Barnabas from one kind of monster into another? If you’re going to chop off Jeff’s head for Barnabas’ use, why not just use Jeff’s body entirely? It makes no sense to put him in a stitched-up crazy-quilt of a body. At least in “The Brain that Wouldn’t Die” there was a reason to attach Jan’s head to a new body (aside from presumably increasing her hotness). Dr. Clumsy wrecked her old body in a car crash. All Barnabas needs is a new non-Barnabas body. An intact one makes more sense that a piecemeal one. Yeah – this applies to the original Frankenstein story, too. It makes no sense at all. I suppose the only reason they did it in the original was that Frankenstein thought he could play god and create new life, so he felt he had to build a body. Like Sarah Connor says in Terminator 2, something about “you scientists think you’re so creative but all you do is destroy stuff”. Nobody is mentioning “The Atomic Brain” (1963) (aka “Monstrosity”)? One of the great personality-transplant badfilms. I thought about the refrigeration of Adam problem. All I can think of is that, yes, Adam is probably rotting away, but maybe his body is hooked up to a machine that keeps the juices flowing, so to speak. (We don’t see or hear it, though.) Either that, or maybe as soon as his guests leave, Dr. Lang sticks Adam in a giant Tupperware container. It is interesting to watch how the last scene of the previous episode, 475, is restaged for the opening scene of episode 476. On Friday, John Sedwick had Barnabas and Dr. Lang start their dialogue at the top of the stairs that lead down into the lab. Lela Swift, instead, begins with them standing on the floor of the lab proper. I think that Sedwick had more leisure to stage the scene, and both he and the audience knew that Lang and Barnabas were arriving from their previous location. Swift, on the other hand, probably had less time. In her version, the actors did not have to move as far across the set as they did on Friday. No bouncing down the stairs. Just start talking and then move a few feet to the gurney with Adam. Stinging musical note. Cue the pounding surf and main theme.